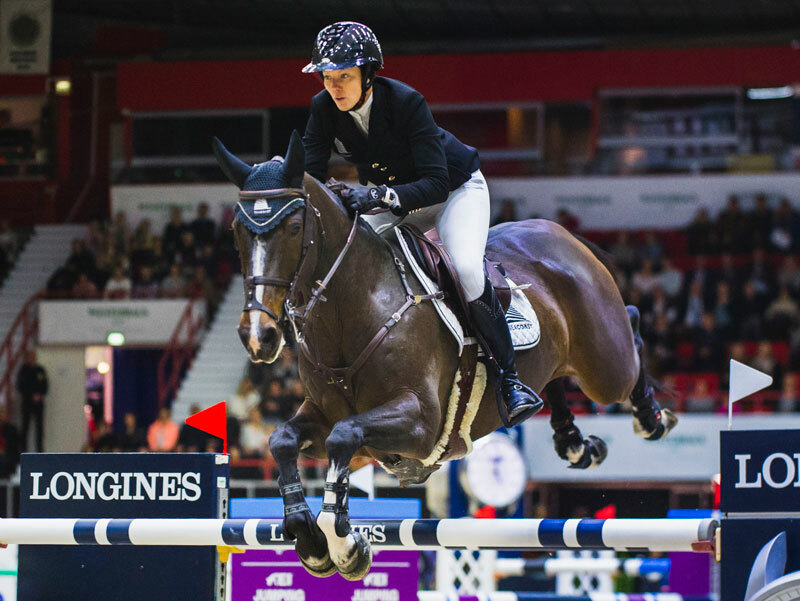 And it wasn’t the easiest of tasks because the second-round decider was stacked high with some of the most formidable opposition on the showjumping planet. Swiss supremo Steve Guerdat set a blistering target with the great mare Hannah when third to go against the clock, but they just kept getting quicker and quicker. However Patteet, who has an outstanding reputation as a producer of top-class young horses, is no shrinking violet, and neither is her quirky 12-year-old gelding. “He’s not normal, he’s very complicated and very, very hot, but he’s so brave and very talented. I’m really happy for him, he was super today,” said Patteet. However Pateet and Pebbles most certainly did, racing through the track with absolute determination and scorching through the finish in the winning time of 39.30 as the crowd went wild with excitement. Last in, Hans-Dieter Dreher and the flamboyant 17-year-old stallion Embassy ll gave it their best shot, but when the Longines clock showed 39.47 seconds the German duo had to settle for runner-up spot ahead of Fredricson in third. Pateet, who is based in the heart of Belgium’s horse-country between Brussels and Antwerp, won gold in 2013 and bronze this year at the prestigious FEI WBFSH Championships for Young Horses in Lanaken, Belgium. “I used to ride them from four-year-olds but now I start riding them at six, and I want to continue doing that because you become more of a team with your horse when you ride them from when they are young”, she said today. She only acquired Pebbles as an eight-year-old however, and he was never easy. He still isn’t. She has an unusual warm-up routine before going into the ring. “First he goes on the lunge, and then I get on him with 10 horses to go because if I warm him up any other way he just loses it! I know how to handle him now, but I have to follow my plan carefully. He’s one of the fastest horses in world so if the plan goes well he can beat anybody,” said Joe Bloggs (Team Country). Today’s win leaves her in second place on the Western European League table going into next week’s third leg of the series in Verona, Italy with Germany’s Dreher sitting in pole position when adding points from last weekend’s open in Oslo (NOR) where he finished sixth.